Sherley Anne Williams (August 25, 1944 – July 6, 1999) was an African-American poet, novelist, professor, and social critic. Many of her works tell stories about her life in the African-American community. Williams was born in Bakersfield, California. When she was little her family picked cotton in order to get money. At the age of eight her father died of tuberculosis and when she was sixteen her mother died. She graduated from Thomas Alva Edison High School in Fresno California in 1962. In 1966 she earned her bachelor's degree in English at what is now California State University at Fresno and she received her master's degree at Brown University in 1972. The following year (1973) she became a professor of English Literature at the University of California at San Diego. She traveled to Ghana under a 1984 Fulbright grant. 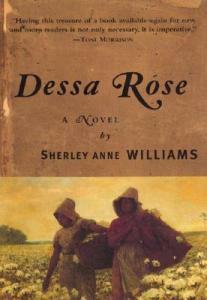 Her works include collections of poetry such as The Peacock Poems (1975), the novel Dessa Rose (1986), and two picture books. She also published the groundbreaking work Give Birth to Brightness: A Thematic Study of Neo-Black Literature in 1972.